I have not moved to the new facilities yet, I am still with the others in the old original centre. Everything is horrifying here, it is a drastic situation. We have no power, no water and no food. I don’t check my phone all the time, it is extremely hard to recharge as there are only a few solar chargers in the centre. One of the two Australian centers on foreign soil (the other one being on Nauru. cf. Alison Mountz, “Australia’s Enforcement Archipelago” in The Funambulist 9 Islands), the Manus camp had been ruled in April 2016 by the Papua New Guinea’s Supreme Court as breaching the constitution’s right to personal liberty and was therefore illegal and should be closed. A legal settlement “was reached on the provision that the Australian government denied any and all liability for the mistreatment and false imprisonment of people on Manus Island” (B. Doherty & C. Wahlquist, June 2017). 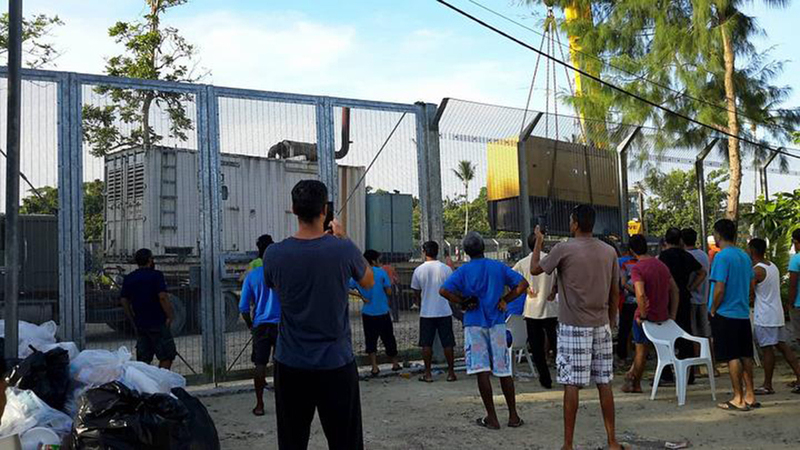 Removal of the electric generator of the Manus camp on November 1, 2017. The definitive closure of the camp occurred this Wednesday (November 1, 2017), when the Australian security guards left the premises, and that water, food and electricity supplies were cut off. The former detainees were ‘offered’ by the Australian authorities to relocate to another facility in Lorengau, Manus’ main town. 600 refugees however refused to do so (see the powerful video of their pledge to stay in the camp until being offered dignified and safe conditions of life), emphasizing the absence of any guarantee of security to protect them against the attacks of some of the locals, as it has happened in the past (including from the Papua New Guinea armed forces themselves who shot at the camp in April 2017), and underlining the absolute denial of rights they are experiencing. They have consequently appropriated the space of the camp in a radical inversion of architecture’s violence, from the highest architectural crime that containment and incarceration constitute to the use of the same walls to defend themselves against potential attackers. We should however not romanticize this appropriation: the situation, described as “horrifying” by Imran, is the only tenable option in the drastically limited agency given to refugees, while calling for a dignifying relocation to a “safe society.” The digging of a well and toilets, the collect of water in empty trash containers and of tree fruits for food, or the use of solar cells to charge cell phones to keep communication outside of the camp and the island, are not to be commented as the manifestation of ingenuity or creativity that certain people patronizingly describe in their fascination for self-constructed or appropriated neighborhoods around the world: they constitute instead the mere efforts for survival against state violence, be it implemented through border control, policing, incarceration, or the abandonment of people in a place of extreme vulnerability after forcefully displacing them there. Collecting and storing rain water. Digging a hole for toilets. / Photos from Oct 31 and Nov 1. 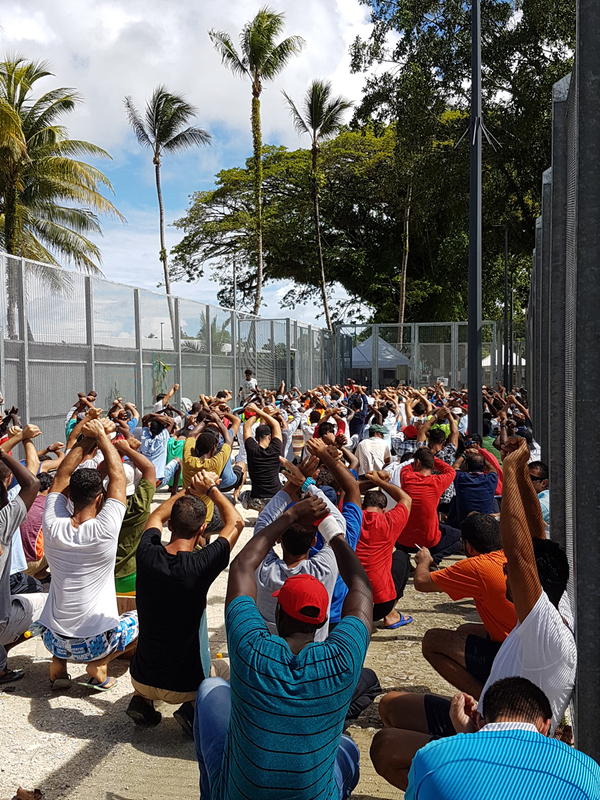 The feeling of utter powerlessness regarding the fate of the Manus survivors experienced 14,000 kilometers from them should not blind us from European and American responsibility on the matter. The drastic anti-immigration policies implemented by the Australian State, whose violence is only equated by the ones deployed on Aborigene lives, were not created in a vacuum. They emerge from the structures of European settler colonialism, both in its management of populations and borders, and although the detention camps of Manus Island, Nauru and Christmas Island implement particularly extreme and deadly conditions in the enforcement of these policies due to their remote situations, the global political programs of border militarization and incarceration are what is at stake here. As for the very reasons that leave very little choice to people but to flee from the places where they live, they are often direct or indirect consequences to past and recent histories of European and American colonialism and imperialism. 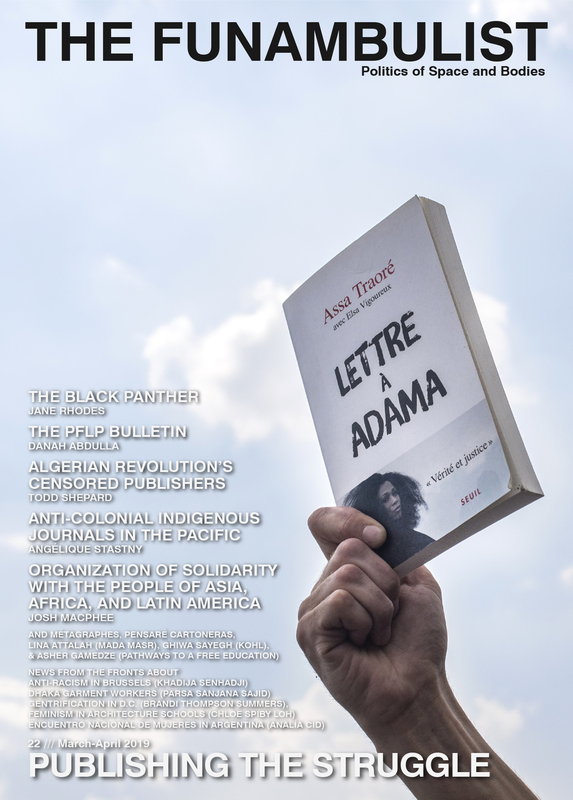 There is therefore a crucial need to participate to the political struggle against the racialized inequality regarding rights to movement and safety in general, and to formulate in particular an unequivocal statement of solidarity with Manus refugees and the activist support networks in Australia (and perhaps in Papua New Guinea) organized to support them and amplify their voice. I would like to thank another contributor to The Funambulist, Michelle Bui, who gathers and propagates information and actions in relation to Manus, and who introduced me to Imran. For much more incarnated account on the situation, you can read the texts written daily by Behrouz Boochani for The Guardian or other texts written by refugees themselves, like Imran or Shamindan Kanapadhi. “On day 43 of our demonstrations, we gathered to raise our concerns peacefully and silently to the whole world as we have been the victims of Australian’s systematic torture. We fear for our lives, safety and future in this isolation.” / Photograph and caption by Imran Mohammad from a few weeks before the closure of the camp (September 2017).